Carbon Dioxide Information Analysis Center, Oak Ridge National Laboratory, Oak Ridge, Tennessee, U.S.A.
Takahashi, T., F. Millero, R. Key, D. Chipman, E. Peltola, S. Rubin, C. Sweeney, and S. Sutherland, 2005. 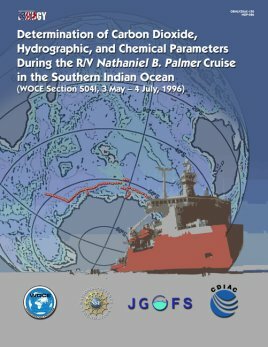 Determination of Carbon Dioxide, Hydrographic, and Chemical Parameters during the R/V Nathaniel B. Palmer Cruise in the Southern Indian Ocean (WOCE Section S04I, 3 May - 4 July, 1996), ed. A. Kozyr. ORNL/CDIAC-150, NDP-086. Carbon Dioxide Information Analysis Center, Oak Ridge National Laboratory, U.S. Department of Energy, Oak Ridge, Tennessee, 50 pp. doi: 10.3334/CDIAC/otg.ndp086. This report discusses the procedures and methods used to measure total carbon dioxide (TCO2), total alkalinity (TALK), and partial pressure of CO2 (pCO2) at hydrographic stations during the cruise of research vessel (R/V) Nathaniel B. Palmer in the Southern Indian Ocean on the S04I Section as a part of the Joint Global Ocean Flux Study (JGOFS)/World Ocean Circulation Experiment (WOCE). The carbon-related measurements were sponsored by the U.S. Department of Energy (DOE). The expedition started in Cape Town, South Africa, on May 3, 1996, and ended in Hobart, Australia, on July 4, 1996. Instructions for accessing the data are provided. The TCO2 was measured in discrete water samples using the Lamont-Doherty Earth Observatory (LDEO) coulomteric system with an overall precision of ±1.7 µmol/kg. TALK was determined by potentiometric titration with an overall precision of ±1.7 µmol/kg. During the S04I cruise pCO2 was also measured using the LDEO equilibrator-gas chromatograph system with a precision of 0.5% (including the station-to-station reproducibility) at a constant temperature of 4.0°C. The R/V Nathaniel B. Palmer S04I data set is available free of charge as a numeric data package (NDP) from the Carbon Dioxide Information Analysis Center. The NDP consists of the oceanographic data files and this printed documentation, which describes the contents and format of all files as well as the procedures and methods used to obtain the data. Keywords: carbon dioxide, TCO2, TALK, partial pressure of CO2, carbon cycle, coulometry, potentiometry, hydrographic measurements, World Ocean Circulation Experiment. The World Ocean Circulation ExperimentWorld Hydrographic Program (WOCE-WHP) was a major component of the World Climate Research Program. 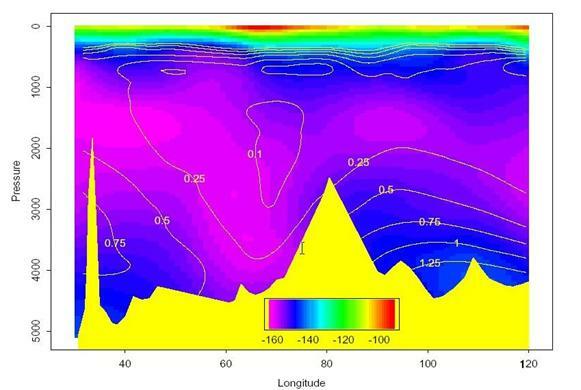 The primary goal of WOCE was to understand the general circulation of the global ocean well enough to be able to model its present state and predict its evolution in relation to long-term changes in the atmosphere. The need for carbon system measurements arose from the serious concern over the rising atmospheric concentrations of carbon dioxide (CO2). Increasing atmospheric CO2 may intensify the earths natural greenhouse effect and alter the global climate. Although CO2-related measurementsspecifically, total CO2 (TCO2), total alkalinity (TALK), partial pressure of CO2 (pCO2), and pHwere not official WOCE measurements, a coordinated effort was supported as a core component of the Joint Global Ocean Flux Study (JGOFS). This effort received support in the United States from the U.S. Department of Energy (DOE), the National Oceanic and Atmospheric Administration (NOAA), and the National Science Foundation (NSF). 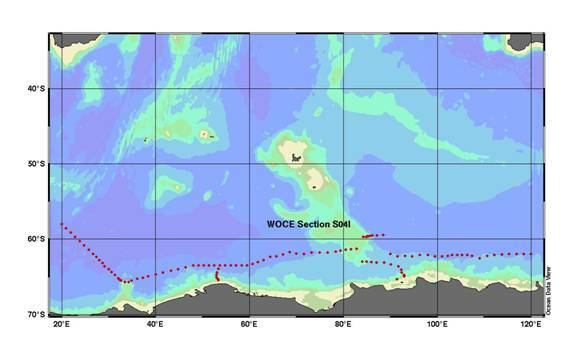 This report discusses results of the research vessel (R/V) Nathaniel B. Palmer expedition along the WOCE Section S04I. The cruise started from Cape Town, South Africa, on May 3, 1996, and disembarked at Hobart, Australia, on July 4, 1996. The ship occupied 108 stations along 60-62°S latitude from 20°E to 120°E meridian, plus two north-to-south sections south from this line to the Antarctic continental shelf (Fig. 1). Fig. 1. Cruise track during the R/V Nathaniel B. Palmer Indian Ocean section of the Southern Ocean survey expedition along WOCE section S04I. To better constrain the fluxes of carbon, both organic and inorganic, in the Southern Ocean and to place these fluxes into the context of the contemporary global carbon cycle. There is a great interest in understanding the CO2 system in the oceans because of the so-called greenhouse effect of CO2 on the climate. Approximately 30% of CO2 added to the atmosphere from the burning of fossil fuels is thought to be going into the oceans. To identify the factors and processes which regulate the magnitude and variability of primary productivity, as well as the fate of biogenic materials. To determine how the Southern Ocean has responded in the past to naturally occurring climate changes. To monitor and predict the response of the Southern Ocean to global climate change. The measurements along S04I section provide a rare look at the far south Indian Ocean in an oceanographically important time of year, when the sea surface is cooling and dissolved gases and other properties are being mixed downward. The R/V Nathaniel B. Palmer is a large icebreaker in the service of the U.S. National Science Foundation. It is tasked with extended scientific missions in the Antarctic. The vessel carries a helicopter and about four dozen scientists on expeditions that last for months. The vessel is named after the first American credited with sighting Antarctica. This R/V, built for the NSF and launched in 1992, is chartered and operated by the Raytheon Company. Table 1 provides a detailed description of the ship. The S04I section constituted the Indian Ocean portion of WOCE line S04, a meridional circumnavigation of Antarctica at a nominal latitude of 60°S. This segment covered the longitudes from 20°E to 120°E. R/V Nathaniel B. Palmer departed Cape Town, South Africa, on May 3, 1996. The cruise track proceeded south to near 58°S and 20°E where station occupations began on May 16. The first station line was run southeast to Gunnerus Ridge, about 50 miles south of the ice edge (see Fig.1). During the transit to station 1 and continuing to 58°S, 17 autonomous Lagrangian circulation explorer (ALACE) floats were launched. Stations across the Enderby Abyssal Plain trended east-northeast from 66°S at 33°E to 61°S at 83°E on the Kerguelen Plateau. A line of stations (35-42) was made north from the 500-m isobath on the continental slope at 53°E, and three self-reporting current meters were deployed along the slope. A line of stations (65-72) extending east from the crest of the Kerguelen Plateau was made at about 59°S, and three more current meters were placed in the boundary current on the eastern flank of the plateau. On June 8, after station 72, science operations were suspended for seven days when R/V Nathaniel B. Palmer was diverted to Mirnyi Station in the Davis Sea to deliver emergency food supplies. On June 14, R/V Nathaniel B. Palmer left Mirnyi and began a line of stations (73-86) from the shelf break of the Davis Sea to Kerguelen Plateau. One current meter was placed near the 3000-m isobath north of the Antarctic Continental Slope, and two were deployed at the southern end of Kerguelen Plateau. The zonal line of stations at a nominal latitude of 62°S was resumed at 90°E. Ice conditions and fuel and time considerations necessitated 45-mile station separation for most of the final 22 stations. The last station, No. 108, was sampled at 120°E on June 27, and Nathaniel B. Palmer then transited directly to Hobart, Australia, arriving on July 7, 1996. For more information on the cruise please see the chief scientist cruise report at http://whpo.ucsd.edu/data/onetime/southern/s04/s04i/s04ido.txt. The basic hydrography program consisted of salinity, dissolved oxygen, and nutrient (nitrite, nitrate, phosphate, and silicate) measurements made from bottles taken on CTD/rosette casts, plus pressure, temperature, salinity, and dissolved oxygen from CTD profiles. Overall, 109 CTD/rosette casts were made at 108 stations, usually to within 5-15 meters of the bottom. Station 2 cast 1 was aborted at the surface because of signal failure at 322 m on the down-cast. Water was found inside the CTD case; after repairs, station 2 cast 2 was successfully accomplished. Hydrographic casts were performed with a rosette system consisting of a 36-bottle rosette frame [Oceanographic Data Facility (ODF)], a General Oceanics (GO) 36-place pylon (Model 2216) and thirty-six 10-L PVC bottles (ODF). Underwater electronic components consisted of an ODF-modified NBIS Mark III CTD (ODF #3) and associated sensors, SeaTech transmissometer [Texas A&M University (TAMU)] and Benthos pinger (Model 2216). Two Guildline Autosal Model 8400A salinometers were available for measuring salinities. The salinometers were modified by ODF and contained interfaces for computer-aided measurement. Autosal No.55-654 was used to measure salinity on all stations. Its water bath temperature was set and maintained at 24°C for all runs except stations 32-39, where the bath temperature was set at 21°C. The salinity analyses were performed when samples had equilibrated to laboratory temperature, within 7-28 hours after collection. The salinometer was standardized for each group of analyses (typically one cast, usually 36 samples) using two fresh vials of standard seawater per group. A computer (PC) prompted the analyst for control functions such as changing sample, flushing, or switching to read mode. At the correct time, the computer acquired conductivity ratio measurements and logged results. The sample conductivity was redetermined until readings met software criteria for consistency. Measurements were then averaged for a final result. Dissolved oxygen analyses were performed with an ODF-designed automated oxygen titrator using photometric end-point detection based on the absorption of 365-nm wavelength ultra-violet light. The titration of the samples and the data logging were controlled by PC software. Thiosulfate was dispensed by a Dosimat 665 burette driver fitted with a 1.0-mL burette. ODF used a whole-bottle modified-Winkler titration following the technique of Carpenter (1965) with modifications by Culberson et al. (1991), but with higher concentrations of potassium iodate standard (approximately 0.012N) and thiosulfate solution (50 gm/L). Carbon disulfide was added to the thiosulfate as a preservative. Standard solutions prepared from pre-weighed potassium iodate crystals were run at the beginning of each session of analyses, which typically included from 1 to 3 stations. Nine standards were made up during the cruise and compared to ensure that the results were reproducible, and to preclude the possibility of a weighing or dilution error. Reagent/distilled water blanks were determined to account for presence of oxidizing or reducing materials. Nutrient analyses (phosphate, silicate, nitrate, and nitrite) were performed on an ODF-modified 4-channel Technicon AutoAnalyzer II, generally within a few hours after sample collection. Occasionally samples were refrigerated up to a maximum of 8 hours at 2°C to 6°C. All samples were brought to room temperature prior to analysis. The methods used are described by Gordon et al. (1993). The analog outputs from each of the four channels were digitized and logged automatically by computer (PC) at 2-second intervals. Silicate was analyzed using the technique of Armstrong et al. (1967). An acidic solution of ammonium molybdate was added to a seawater sample to produce silicomolybdic acid, which was then reduced to silicomolybdous acid (a blue compound) following the addition of stannous chloride. Tartaric acid was also added to impede PO4 color development. The sample was passed through a 15-mm flowcell and the absorbance measured at 660 nm. A modification of the Armstrong et al. (1967) procedure was used for the analysis of nitrate and nitrite. For the nitrate analysis, the seawater sample was passed through a cadmium reduction column where nitrate was quantitatively reduced to nitrite. Sulfanilamide was introduced to the sample stream followed by N-(1-naphthyl) ethylenediamine dihydrochloride, which coupled to form a red azo dye. The stream was then passed through a 15-mm flowcell and the absorbance measured at 540 nm. The same technique was employed for nitrite analysis, except the cadmium column was bypassed, and a 50-mm flowcell was used for measurement. Phosphate was analyzed using a modification of the Bernhardt and Wilhelms (1967) technique. An acidic solution of ammonium molybdate was added to the sample to produce phosphomolybdic acid, then reduced to phosphomolybdous acid (a blue compound) following the addition of dihydrazine sulfate. The reaction product was heated to ~55°C to enhance color development then passed through a 50-mm flowcell and the absorbance measured at 820 nm. 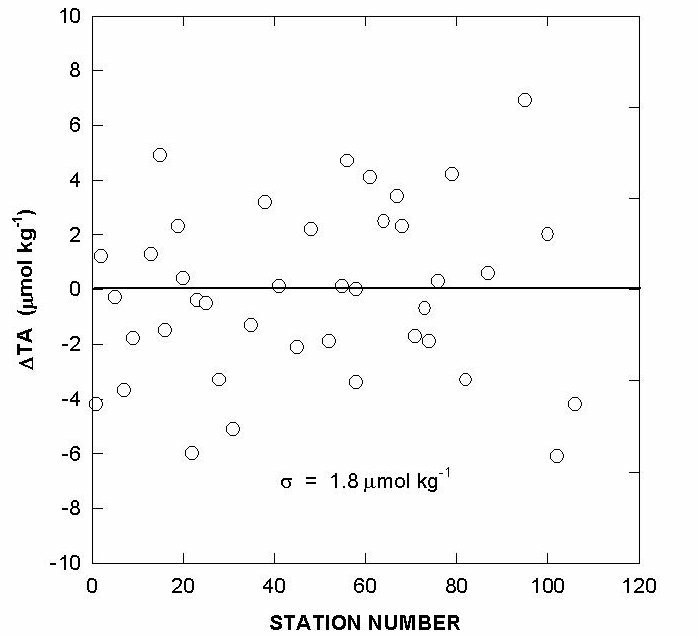 The coulometric analysis system used to measure the total CO2 (TCO2) concentration in seawater samples during this cruise was the same as described in Chipman et al. (1993) and Takahashi et al. (1998), except for the way the sample was introduced. The system consists of a Model 5011 coulometer, manufactured by UIC Inc., Jolliet, IL, and a sample introduction/CO2 extraction system of a Lamont-Doherty Earth Observatory (LDEO) CO2 Group design. It differs from the single-operator multi-parameter metabolic analyzer (SOMMA) system used by other participants of the DOE/CO2 program. In the LDEO system, the titration cell was maintained at a constant temperature (about 25°C) using a water-jacketed cell to prevent drifts of the titration end point. The temperature of the water circulating through the jacket was kept at a constant temperature by a temperature-controlled heat exchanger system. A precisely known volume of seawater sample was introduced manually into a CO2 extraction vessel using a calibrated syringe instead of the automated pipette used by the SOMMA system. The syringe is a hand-ground Pyrex glass medical syringe with two firm reference stops which allow the quantitative sampling of seawater. Our experience with syringe and pipette methods is that accumulated coatings on the glass surfaces from repeatedly being filled with and emptied of seawater would not significantly affect the volume contained of either, but that it will affect the volume delivered by the passively drained pipette in the SOMMA system. The positive displacement of the plunger of a syringe keeps the delivered volume constant, even in the presence of surface coatings. Additionally, since the water sample in the syringe has no air space, changes in TCO2 due to gas exchange with air in the head space are eliminated. Unlike the SOMMA, our system allows multiple samples from the same bottle. We can test the reproducibility of either certified reference material (CRM) or seawater samples by taking two or more samples with the syringes. For this reason, the total number of analyses for CRM on the LDEO system was three times greater than if SOMMA were used. Samples for TCO2 analysis were drawn from the Niskin bottles of the rosette casts directly into 250-mL glass reagent bottles with ground standard-taper stoppers, sealed with silicone grease and pressed in using two strong rubber bands. Immediately after sample collection, 200 µL of 50%-saturated mercuric chloride solution was added to prevent biological alteration of the TCO2. A small head space (~5 mL) was left in the bottle to prevent thermal expansion of the water from causing a leak or breaking the bottle. Samples were normally analyzed within 24 hours of collection. For analysis, a water sample was sucked into a syringe, and a calibrated volume (19-20 mL) of water sample was introduced into a CO2 extraction chamber through a rubber septum. The mass of the seawater sample delivered was determined from the density of seawater, calculated using the measured salinity, the temperature at the time of injection, and the International Equation of State of Seawater. Prior to the expedition, the volume of each sampling syringe between two reference stops was determined by repeatedly weighing aliquots of distilled, deionized water dispensed. The measurements were corrected for the buoyancy of air displaced by the water, amounting to about 0.1% of the weight of the water. The volume was then computed using the density of pure water at the temperature of the measurement. Repeated measurements gave a precision of ±0.03% or better. The seawater sample in the extraction vessel was acidified with ~1 mL of 8.5% phosphoric acid introduced through a sidearm of the extraction chamber. The evolved CO2 was stripped from the sample and transferred into the electrochemical cell of the CO2 coulometer by a stream of CO2-free air. In the coulometer cell, the CO2 was quantitatively absorbed by a solution of ethanolamine in dimethylsulfoxide (DMSO). Reaction between the CO2 and the ethanolamine formed the weak hydroxyethylcarbamic acid. The pH change of the solution associated with the formation of this acid resulted in a color change of the thymolphthalein pH indicator in the solution. The color change, from deep blue to colorless, was detected by a photodiode which continuously monitored the transmissivity of the solution. The electronic circuitry of the coulometer, in detecting the change in the color of the pH indicator, caused an electrical current to flow through the cell, generating hydroxyl (OH-) ions from a small amount of water in the solution. The OH- generated, then titrated the acid, returning the solution to its original pH and color, at which point the current flow was stopped. The product of current passed through the cell and time was related by the Faraday constant to the number of moles of OH- generated, and hence to the number of moles of CO2 absorbed to form the acid. A thermostated, double-walled titration cell was used during titration to eliminate the shifting of the titration endpoint due to a change in the temperature of the cell solutions. The coulometer was calibrated using research grade CO2 gas (99.998% pure) introduced into the carrier gas line upstream of the extraction chamber alternately using two fixed-volume sample loops on a gas-sampling valve. The loops were vented to the atmosphere, and the ambient atmospheric pressure in the laboratory was measured using a high-precision electronic barometer with an accuracy of better than 0.05%. The loop temperatures were measured to ±0.05°C with a thermometer calibrated against one traceable to the NIST. The non-ideality of CO2 was incorporated into the computation of the loop contents. Prior to the expeditions, the volumes of the loops were determined by the difference in weight of the loop injection valve assembly when empty and when filled with water. Repeated measurements gave a precision of ±0.02%. During the expedition the coulometer was calibrated several times a day using this gas-sampling system. The calibration factor, which represents the ratio between the number of moles of CO2 in the loop and the reading of the coulometer, changes during the use of a titration cell. Depending on the condition of the solution in the titration cell, this factor varies around the ideal ratio of unity by a few tenths of a percent. It commonly starts from less than unity when the cell solution is new and increases to greater than unity as increasing amounts of carbon are titrated. This change can be represented by a quadratic equation relating values of calibration factor with the total amount of carbon titrated in a given cell (see Fig. 2). 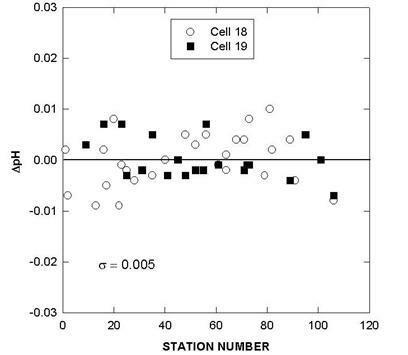 The CO2 concentration in each seawater sample was corrected using a factor estimated from the equation fit to the calibration data for each cell. Generally a cell had to be cleaned and filled with fresh solution after about 40 samples. After this number the cell began to behave erratically with unreliable analytical results. For the purpose of quality control of total CO2 determinations, Scripps Institution of Oceanography (SIO) CRM, Batch 31, was run through our analytical system at sea as unknowns. The shipboard analyses compare with the SIO manometric analyses shown in Table 2. *N = number of analyses. Since more than one sample was taken from each CRM bottle and analyzed, number of analyses exceeded the number of the CRM bottles supplied. The ± values indicate one standard deviation from the mean. Figure 3 shows the results graphically. The results of the shipboard analyses that were made using a high-purity CO2 gas standard are 1.7 µmol/kg greater than the results of the SIO manometric analyses. The difference is, however, within the combined standard deviation for each set of measurements, and it is well within two standard deviations of each set. The TCO2 values listed in this report are not adjusted for this difference. The documentation for the CRM batch provided by Andrew Dickson is reproduced in Table 3. Fig. 3. The results of TCO2 analyses of the certified reference solutions using the coulometer during the expedition. *These values were not measured when the batch was certified, but are based on measurements on archived samples. • Note: Nutrient levels may have changed on storage, their stability has not been examined. The titration system for TALK determination used during expedition along WOCE section S04I was similar to the one used in our earlier studies (Millero et al. 1993). The systems consisted of a titrator (Metrohm, model 665 Dosimat) and pH meter (Orion, model 720A). Both instruments were controlled by computer. The electrodes used to measure the emf of the sample during a titration consisted of a ROSS glass pH electrode (Orion, model 810100) and a double junction Ag, AgCl reference electrode (Orion, model 900200) with an inner filling of 0.7 m NaCl. The temperature of both the acid titrant in a water-jacketed burette and the seawater sample in a water-jacketed cell were controlled to a constant temperature of 25 ± 0.1°C with a constant temperature bath (Neslab, model RTE 221). The Plexiglas water-jacketed cells used during the cruise were similar to that used by Bradshaw et al. (1988) except with a larger volume (about 200 cm3) to increase the precision. This cell had a fill and drain valve, which increased the reproducibility of the volume of sample contained in the cell. The volumes of the cells used at sea were determined in the laboratory before and after the cruise by several titrations using seawater of known TALK. The volumes of the cells did not change during the cruise. The nominal volumes of all the cells were about 200 cm3 and the values were determined to ±0.03 cm3 (cell 18 - 204.34 cm3, cell 19 - 203.76 cm3). A Lab Windows-C program was used to run the titration and record the volume of the added acid and the emf of the electrodes using RS232 interfaces. Seawater samples were titrated by adding HCl to exceed the carbonic acid end point. During a typical titration the emf readings are recorded after the readings become stable (±0.09 mV), and then a volume of acid is added to change the voltage to a pre-assigned increment (13 mV). In contrast to the delivery of a fixed volume increment of acid, this method gives an even distribution of data points in the range of rapid increase in the emf near the endpoint. A full titration (25 points) takes about 20 minutes. Using two systems, a 36-bottle station cast can be completed in 6 hours. Calibrations of the burettes of the Dosimat with water at 25°C indicate that the systems deliver 3.000 cm3 (the value for a titration of seawater) to a precision of ±0.0004 cm3. This uncertainty results in an error of ±0.4 µmol/kgin TALK and TCO2. Corrections due to a small error in the volume delivery have been applied to our titration data. The precision of the values of TALK on a CRM (Dr. Andrew Dickson, Marine Physical Laboratory, La Jolla, California) is ±2 µmol/kg (Lee and Millero 1995). Standard acid was made by preparing a single large 55-gal batch of ~0.25 M HCl acid by dilution of concentrated HCl, AR Select® Mallinckrodt. The acid was prepared in 0.45 M NaCl to yield a total ionic strength similar to seawater of salinity 35.0 (I~0.7 M). The acid was standardized by a coulometric technique (Taylor and Smith, 1959; Marinenko and Taylor, 1968). The acid is titrated with OH- generated coulometrically at a Pt electrode. The current is recorded as a function of time with data acquisition measuring the voltage across a standard 1-ohm resistor. An Orion combination electrode was used to measure the pH of the solution during the titration. The endpoint is determined from the plot of the concentration of H+ and OH- in the solution as a function of the coulombs delivered. The precision of the coulometric titration was 0.002 %. Sub-samples of the acid were sent to Dr. Andrew Dicksons laboratory in La Jolla, California, for an independent laboratory determination of the molarity. TALK titrations on the same seawater using different acids calibrated by this technique agree to within ±2 µmol/kg. The calibrated concentration of the acid used during this cruise was 0.24793 ±0.00009 M HCl. The acid was bottled in 500-cm3 glass bottles for field use. The TALK of seawater was evaluated from the proton balance at the alkalinity equivalence point, pHequiv = 4.5, according to the exact definition of TALK (Dickson 1981). The full titration is used to evaluate TALK from a given experiment. This is accomplished with a program patterned after that developed by Dickson (1981), Johansson and Wedborg (1982), and Dickson and Goyet (DOE 1994). The program determines pH, E* (for the electrode), TALK, TCO2, and pK1 for carbonic acid in the solution (Na2CO3, TRIS or seawater). The program used the Levenberg-Marquardt nonlinear least-squares algorithm to perform the calculations. The program assumes that the nutrients are negligible in the calculation. This does not affect the calculated TALK, which includes the alkalinity due to nutrients. The concentration of the effect of nutrients on TALK, however, must be considered when calculating the carbonate alkalinity ([HCO3-] + 2 [CO32-]). Our effort during this cruise was to provide reliable TALK measurements on all the collected samples. Measurements on CRM (batch No. 31) were made before and during the cruise to monitor the performance of the titrators. A summary of the titration results for TALK, TCO2, and pH are given in Table 4. Deviations from the mean of TALK, TCO2, and pH for CRM over the course of the cruise are given in Figs. 4, 5, and 6. 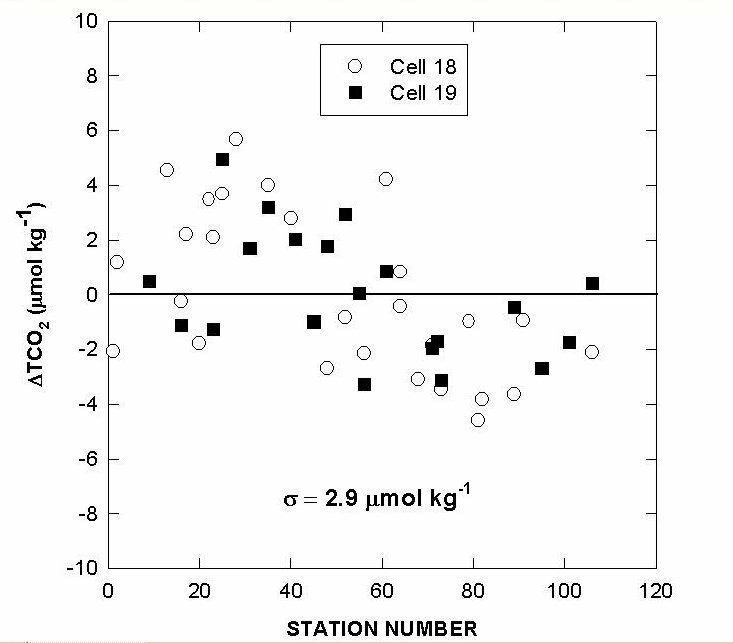 The values of TALK of cell 18 (2130 ± 2.3 µmol/kg) and cell 19 (2129 ± 3.5 µmol/kg) determined at sea were in good agreement with the laboratory results (2128 ± 0.09 µmol/kg). Measurements made on 47 CRM samples using the two cells at sea also indicate that the systems have a reproducibility of ±2.9 µmol/kg in TCO2 and ±0.005 in pH. 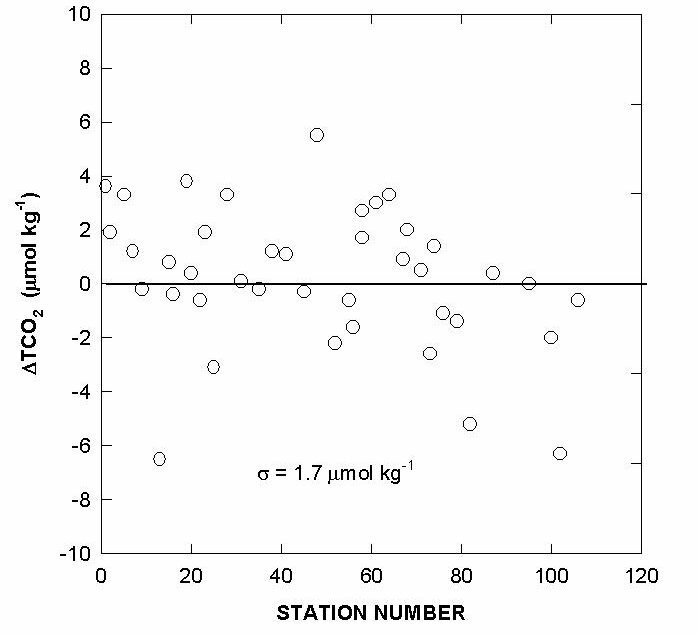 The potentiometric measurements of pH at sea were 0.017 ± 0.005 higher than the laboratory spectroscopic values while the TCO2 values were 10 ± 3 µmol/kg higher. These differences are due to the non-Nernstian response of the electrodes (Millero et al. 1993). Since the differences are highly reproducible, we have adjusted all our pH and TCO2 measurements using these corrections. Two batches of surface seawater were also collected to check the precision of the two titration systems during the cruise. 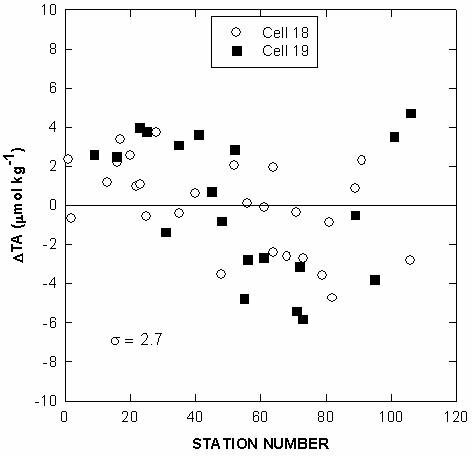 TALK, TCO2, and pH differences of cell 18 and cell 19 over the course of the cruise using this reference surface water are shown in Figs. 7, 8, and 9. The results show an agreement of ± 1.8 µmol/kg in TALK, ±1.7 µmol/kg in TCO2, and ± 0.006 in pH throughout the cruise. The performance of the titrators was also checked by analyzing duplicate samples from the same Niskin bottles for surface water and water collected from 800 meters. The duplicates were analyzed on the same cell and on different cells. The deviations of TALK, TCO2 and pH over the course of the cruise are shown in Figs. 10, 11, and 12. The results showed an agreement of ±1.5-1.6 µmol/kg for TALK, ±1.3-1.7 µmol/kg for TCO2, and ±0.005-0.008 for pH. TALK and total carbon dioxide values of all the surface water samples are plotted in Fig. 13 for the stations occupied. A linear relationship between TALK and salinity is shown in Fig. 14 (TALK = 70.4 + 65.7 S, σ = ±5 µmol/kg). The Normalized TALK (NTA = TALK*S/35) and TCO2 (NTCO2 = TCO2*S/35) are plotted versus station in Fig. 15. The values of NTA = 2370 ± 5 µmol/kg and NTCO2 = 2230 ± 9 µmol/kg for the surface waters do not show large variations. They seem, however, to be higher on the first north-to-south section at 63-65°S latitude and 52-54°E longitude (stations 38-41). The salinity range is very narrow in the waters of Antarctica (33.8-34.3), compared with, for example, the values of North Atlantic waters (34.8-37.5). This narrow range is partly responsible for the uniform values of TALK and TCO2 for the surface waters. All the measurements for TALK, total carbon dioxide, and pH vs. depth are presented in Figs. 16, 17, and 18. The CO2 properties of the deep waters were quite uniform (TALK =2355 ±10 µmol/kg, TCO2 = 2240 ±10 µmol/kg and pH = 7.60 ± 0.02). Lower values of pH were obtained at 62-63°S latitude and between the longitudes 68-70°E, 85-93°E, and 104-118°E (the same stations that have slightly higher TCO2). The TALK data are combined with the partial pressure of carbon dioxide (pCO2) and total carbon dioxide (TCO2) measurements, which were performed by Dr. Taro Takahashis research group from Lamont-Doherty Earth Observatory, Columbia University, to fully characterize the CO2 system in these waters in future work. Table 4. Summary of the CRM Measurements. Fig. 4. Deviations of total alkalinity for certified reference material over the course of the cruise. Fig. 5. Deviations of total CO2 for certified reference material over the course of the cruise. Fig. 6. Deviations of pH for certified reference material over the course of the cruise. Fig. 7. Differences in total alkalinity of cells 18 and 19 over the course of the cruise using reference surface water. Fig. 8. 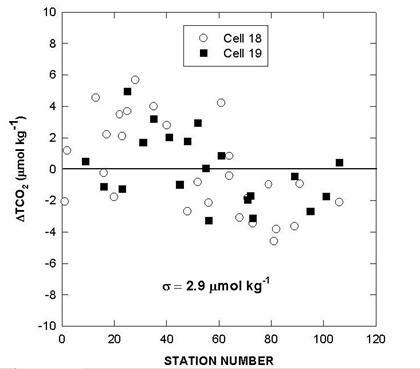 Differences in total CO2 of cells 18 and 19 over the course of the cruise using reference surface water. Fig. 9. Differences in pH of cells 18 and 19 over the course of the cruise using reference surface water. Fig. 10. Sample replicates of total alkalinity, total CO2, and pH on cell 18 (white circlesurface; black circle - 800 m). Fig. 11. Sample replicates of total alkalinity, total CO2, and pH on cell 19 (white circlesurface; black circle - 800 m). Fig. 12. Cell to cell replicate measurements of total alkalinity, total CO2, and pH (white circlesurface; black circle - 800 m). Fig. 13. Surface water total alkalinity and total CO2 for each station. Fig. 14. 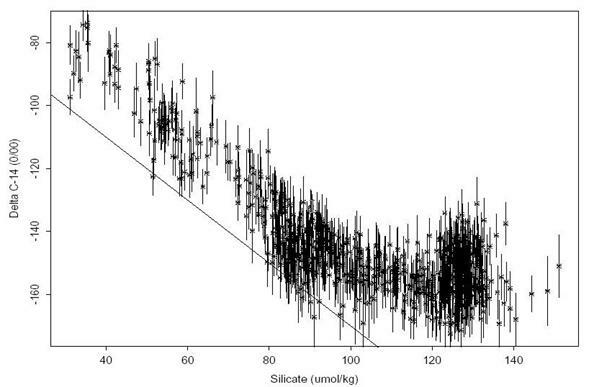 Linear relationship between surface total alkalinity and salinity. Fig. 15. Normalized surface water total alkalinity and total CO2. Fig. 16. Measured total alkalinity vs. depth. Fig. 17. Measured total CO2 vs. depth. Fig. 18. Measured pH vs. depth. A semi-automated equilibrator-gas chromatograph (GC) system was used during the expedition for the determination of partial pressure of CO2 (pCO2) exerted by the seawater samples. Its design has been described by Chipman et al. (1993) and is summarized in this report. The schematic representation of the analytical system is shown in Chipman et al. (1993) as well as in Takahashi et al. (1998). The system consisted of a pair of circulation pumps plumbed to recirculate air in a closed system through porous plastic gas dispersers immersed in two separate seawater samples. Electrically driven Valco 4-port valves were used to isolate each of the equilibrators during the initial equilibration. Manually operated 2-way and 3-way Whitey valves allowed part of the water in each equilibrator to be replaced with air of known initial CO2 concentration, creating the necessary headspace for equilibration. A drain line in each equilibrator ensured that the volume of water was constant at 500 mL. This allowed us to make accurate corrections for the effect of the perturbation of the sample by the headspace air. The equilibrators were open to the laboratory air through isolation coils, keeping them at atmospheric pressure, and we measured lab atmospheric pressure with a high precision electronic barometer with an accuracy of better than 0.05%. Since the partial pressure of CO2 is strongly affected by temperature, the equilibration flasks were kept immersed in a water bath maintained at 4.00±0.01°C. An electrically driven Valco 6-port valve allowed the entire equilibration system to be isolated, while simultaneously connecting a calibration gas selection valve. A 2-way Skinner solenoid valve (normally closed) on the output of the calibration selection valve allowed the gas flow to be controlled by the system controller. It also provided a necessary second means of stopping the flow of the calibration gases to prevent accidental loss of the calibration gases in case of a control malfunction. The analysis of the CO2 in the equilibrated air or calibration gases was performed using a Shimadzu Mini-2 GC, equipped with a flame ionization detector. A 1-mL sample loop, a pre-column, and an analytical column were attached to an electrically driven Valco 10-port valve within the column oven of the GC. The pre-column, 0.2 m long, and analytical column, 2.0 m long, were both packed with Chromosorb 102. Ultra-high purity hydrogen gas served as the carrier gas. This carrier gas is electrolytically generated by a hydrogen generator and purified by diffusion through a palladium foil membrane. The use of hydrogen as a carrier gas allowed the CO2 to be converted quantitatively to methane in a catalytic converter prior to quantification by the flame ionization detector. Our system used a catalyst of ruthenium metal on Chromosorb W support, and did not require a palladium pre-catalyst as used by Weiss (1981) to remove oxygen from the carrier gas stream. Hydrocarbon-free air to support the combustion in the flame ionization detector was provided by an Aadco Model 737 chromatographic air purifier. A Shimadzu Model CR6A Chromatopac computing integrator controlled the equilibration and calibrations procedure and integrated the output signal from the GC. The analytical procedure is as follows. Water samples were drawn from the 10-L Niskin bottles of a rosette directly into 500-mL, narrow-necked volumetric Pyrex flasks. These served as both sample containers and equilibration vessels. The samples were immediately inoculated with 200 mL of 50%-saturated mercuric chloride solution, sealed airtight with screw caps with conical plastic liners to prevent biological modification of the pCO2, and stored in the dark until measurement. Measurements were normally performed within 24 hours of sampling. A headspace of 3 to 5 mL was left above the water to allow for thermal expansion during storage. Prior to analysis the sample flasks were brought to the water bath temperature of 4°C in the constant temperature bath, and about 45 mL of water was displaced with air of known CO2 concentration. The air in the flasks and in the tubing connecting them to the GC sampling loop was recirculated continuously for about 20 minutes through a gas disperser immersed in the water. This provided a large surface area for gas exchange, and equilibrium for CO2 was attained in 15 minutes. where Cmeas is the mole fraction concentration of CO2 in equilibrated moist air. CO2 gas is assumed to behave as an ideal gas as well as mix ideally with water saturated air in dilute CO2 gas mixtures. The total pressure of equilibrated air was measured by having the head space in the equilibrator flask always at atmospheric pressure. We measured the latter with an electronic barometer at the time each equilibrated air sample was injected into the GC for CO2 determination. Since water vapor was not removed from the sample, we do not have to know the water vapor pressure. Cmeas was determined by using a quadratic equation fit to all three of the standards. Although a quadratic equation was used, the CO2 concentration was very close to a linear function of the GC detector output signal. 856.5 ppm CO2,mean of measurements using GC and coulometry (0.14% difference between those two determinations). Corrections were made to account for the change in pCO2 of the sample water due to the transfer of CO2 between the water and circulating air during equilibration. We know the pCO2 in equilibrated, perturbed water and TCO2 measured by coulometry before the equilibration. We can also calculate the change in TCO2 in the water based on the change in pCO2 between the post-equilibrium value and the known concentration in the pre-equilibrium displacement gas. With the pre-equilibrium TCO2 plus the perturbation in TCO2 during equilibration, we obtain the post-equilibrium TCO2 value. Using the post-equilibrium TCO2 and measured pCO2 values, we can calculate TALK at the end of the equilibration, knowing the temperature, salinity, phosphate, and silicate data. Since the perturbation does not change the TALK, we can calculate the pre-equilibrium pCO2 from the pre-equilibrium TCO2, the calculated TALK, and the other parameters of temperature, salinity, etc. This is the value that we report as pCO2, the pre-equilibrium calculated value. The magnitude of this correction is generally less than 2 microatmospheres (µatm). Detailed computational procedures are described in Takahashi et al. (1998). where t is temperature in degrees Celsius. This relationship is independent of salinity within the normal open ocean range. We estimate the precision of the pCO2 measurement for a single hydrographic station to be about 0.15% based on the reproducibility of replicate equilibrations. 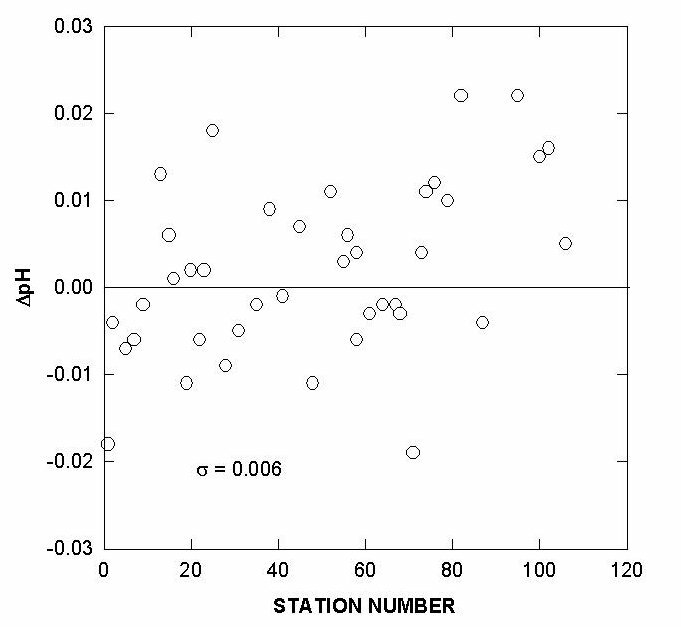 We estimate the station-to-station reproducibility to be about 0.5%. The computer program used for the computation of pCO2 from the input data of TALK, TCO2, temperature, salinity, and the concentrations of silica and phosphate dissolved in seawater. Figure 19 compares the measured and computed pCO2 values obtained during the WOCE S04I expedition. The difference between the observed and computed pCO2 values is plotted as a function of the measured pCO2 value at 4°C. The horizontal solid line indicates the mean of the observed minus computed pCO2 of +5.5 µatm; the fine dotted lines indicate the ±13.8 µatm one standard deviation. A series of solid curves (marked ±0.3%, ±0.2% and ±0.1%) indicate the errors in the computed pCO2 due to errors in TCO2 (or combined errors in TCO2 and TALK). The mean difference of 5.5 ± 13.8 µatm appears to be well within the uncertainties of measurements for the TALK (±0.3%) and TCO2 (± 0.1%). 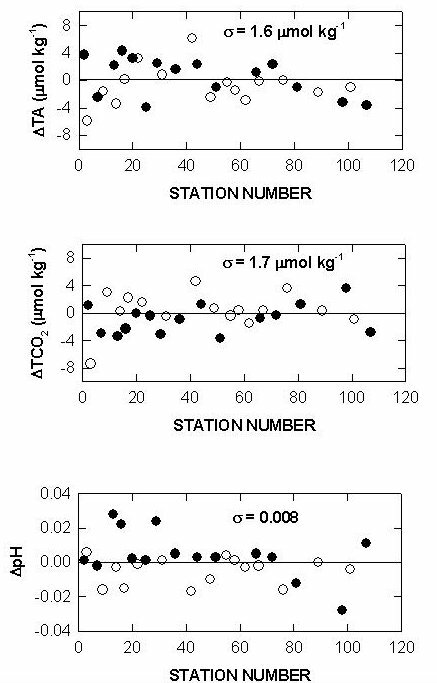 This indicates that the pCO2 values measured at 4°C are consistent mutually with the measured alkalinity and TCO2. This also suggests that the measured carbonate parameters are consistent with the dissociation constants of carbonic, boric, and other acids used for the computation. 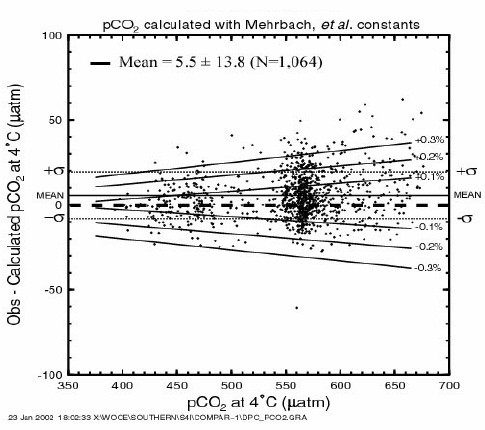 Figure 20 shows a plot of the observed minus measured pCO2 at 4°C as a function of the measured TCO2. The mean difference was 5.5 ± 13.8 µatm, and no systematic trend for the pCO2 difference was observed as a function of TCO2. Figure 21 shows a plot of the observed minus measured pCO2 at 4°C as a function of the TALK/TCO2 ratio. We observe that the mean difference is 5.5 ± 13.8 µatm, and no systematic trend for the pCO2 difference was observed as a function of TCO2. The mean (observedmeasured) pCO2 value was within the uncertainties expected from the errors in the measurements of TALK and TCO2 as demonstrated in Fig. 19. Fig. 19. Difference between the observed and computed pCO2 values at 4°C as a function of the measured pCO2 values. Fig. 20. Difference between the observed and computed pCO2 values at 4°C as a function of the measured TCO2 values. Fig. 21. Difference between the observed and computed pCO2 values at 4°C as a function of the measured total alkalinity/total CO2 ratio. The TALK has been computed from the measured pCO2, TCO2, salinity, and the concentrations of dissolved silica and phosphate. The dissociation constants for carbonic, boric, silicic, and phosphoric acids and that for water are same as those specified in the previous section. The computed alkalinity has been compared with the alkalinity values measured by the Miami group by plotting them against each other (Fig. 22). The linear regression line (the solid line) is in a close agreement with the ideal 1:1 line (the dashed line) well within the scatter of the data points. The mean difference between the measured and computed values is less than 1.5 µeq/kg with a root means square deviation of ±3.7 µeq/kg. 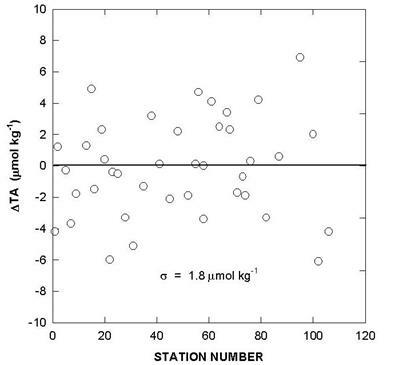 This indicates that the computed alkalinity values are consistent with the measured TALK (or the titration alkalinity) having an estimated uncertainty of about 4 µeq/kg. 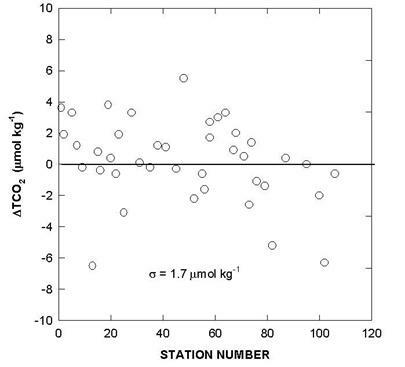 However, it should be noted that while the computed alkalinity is in excellent agreement with the measured values in a range below 2340 µeq/kg, the computed alkalinity values tend to be smaller than the measured values by a few µeq/kg in the higher alkalinity waters. Fig. 22. Difference between the observed and computed total alkalinity values is plotted against the measured total CO2/total alkalinity in seawater. 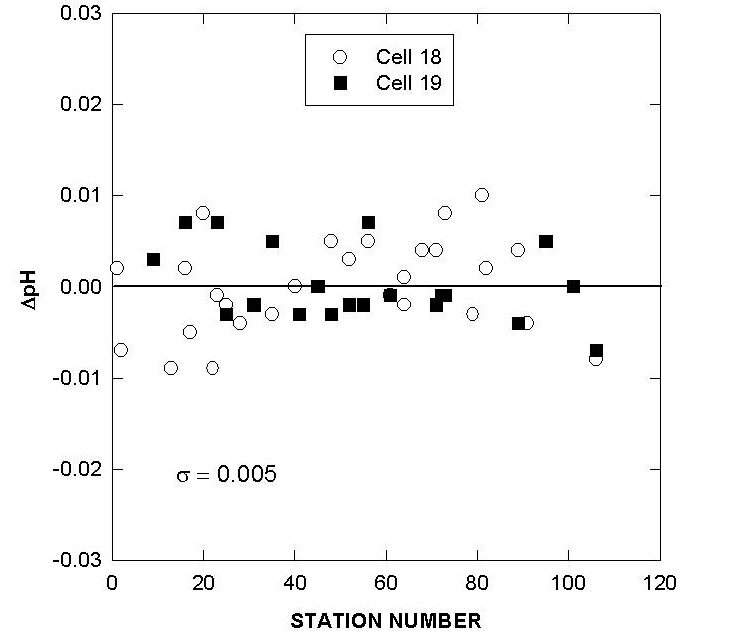 In all, 816 small volume Δ14C samples were collected at 31 stations. The locations of Accelerator Mass Spectrometry (AMS) stations are shown in Fig. 23. For this cruise, 14C sampling was carried out by Robert M. Key (Princeton University); analyses for 14C (and accompanying 13C) were performed at the National Ocean Sciences AMS Facility (NOSAMS) at Woods Hole Oceanographic Institution. R. Key collected the data from the originators, merged the files, assigned quality control flags to the 14C, and submitted the data files to the WOCE office. R. Key is personal investigator for the 14C data and NOSAMS for the 13C data. The replicate measurements were made on four water samples. Table 5 presents the replicate analyses results. The table shows the error-weighted mean and uncertainty for each set of replicates. Uncertainty is defined here as the larger of the standard deviation and the error-weighted standard deviation of the mean. For these replicates, the simple average of the normal standard deviations for the replicates is 1.0. This precision estimate is lower than the average error for the time frame over which these samples were measured (July 1996 − December 1998) and lower than the overall mean error for Pacific WOCE samples (Elder et. al. 1998). Note that the errors given for individual measurements in the final data report (with the exception of the replicates) include only counting errors and errors due to blanks and backgrounds. The uncertainty obtained for replicate analyses is generally a better estimate of the true error since it includes errors due to sample collection, sample degassing, etc. Close examination of the data along 67°S in the deep water indicates that 4o/oo is a more realistic interpretation of the true error associated with this data set. Fig. 23. AMS 14C station map for WOCE Section S04I. bLarger of the standard deviation and the error weighted standard deviation of the mean. Quality flag values were assigned to all Δ14C measurements using the code defined in Table 0.2 of WHP Office Report WHPO 91-1 Rev. 2 section 4.5.2. (Joyce and Corry, 1994). Measurement flags values of 2, 3, and 6 have been assigned. The choice between values 2 (good) and 3 (questionable) involves some interpretation. There is little overlap between this data set and any existing 14C data, so that type of comparison was difficult. In general, the lack of other data for comparison led to a more lenient grading on the 14C data. When using this data set for scientific application, any 14C datum flagged with a "3" should be carefully considered. When flagging 14C data, the measurement error was taken into consideration. That is, approximately one-third of the 14C measurements are expected to deviate from the true value by more than the measurement precision. No measured values have been removed from this data set. Figures 2429 summarize the Δ14C data collected on this leg. Only Δ14C measurements with a quality flag value of 2 ("good") or 6 ("replicate") are included in each figure. Figure 24 shows the Δ14C values with 2σ error bars plotted as a function of pressure. The mid depth Δ14C minimum, which normally occurs around 2500 meters in most of the Pacific, is absent in this section. In fact, there is very little variation in the deep and bottom water. All of the samples for the entire cruise collected at a depth greater than 1000 meters have a mean Δ14C = -153.8±7.2o/oo with a substantial fraction of this variance due to the samples collected very near the Antarctic slope. This result compares remarkably well with the mean of -156.0±8.5o/oo calculated for the WOCE Pacific Antarctic section (S04P). Figure 25 shows the Δ14C values plotted against silicate. The straight line shown in the figure is the least squares regression relationship derived by Broecker et al. (1995) based on the GEOSECS global data set. According to the Broecker et al. (1995) analysis, this line (Δ14C = -70 - Si) represents the relationship between naturally occurring radiocarbon and silicate for most of the ocean. 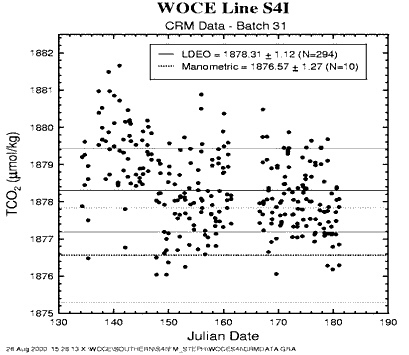 They interpret deviations in Δ14C above this line to be due to input of bomb-produced radiocarbon, however, they note that the technique cannot be applied at high latitudes as confirmed by this data set. With the exception of the very near surface waters, this region of the Pacific shows no change since GEOSECS, which strongly implies that the data in Fig. 25 indicate a failure of the technique in this area rather than bomb-produced contamination throughout the water column. 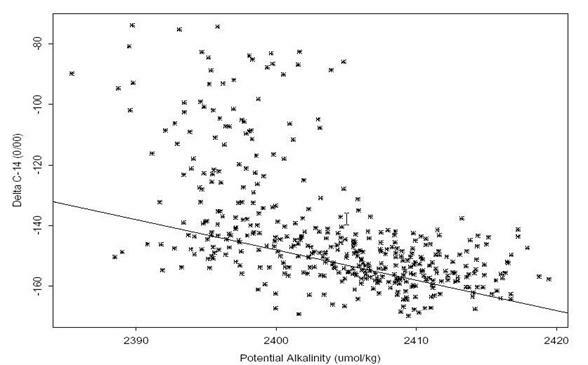 Figure 27 shows all of the S04I radiocarbon values plotted against potential alkalinity normalized to a salinity of 35 (defined as [alkalinity + nitrate]*35/salinity). 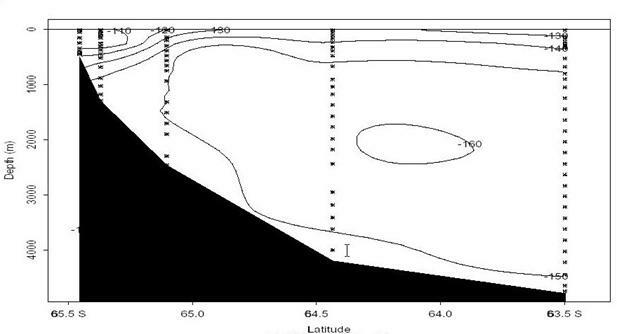 The straight line is the regression fit [14C = -68 -(PALK_35 - 2320)] derived by S. Rubin (LDEO) to all of the GEOSECS results for waters which were assumed to have no bomb-produced 14C (depths greater than 1000 meters, but including high-latitude samples). Preliminary investigation indicates that this new method for separating bomb-produced and natural 14C works in high-latitude waters. For this data set, it appears that the regression intercept derived from the GEOSECS data may be a bit too low. 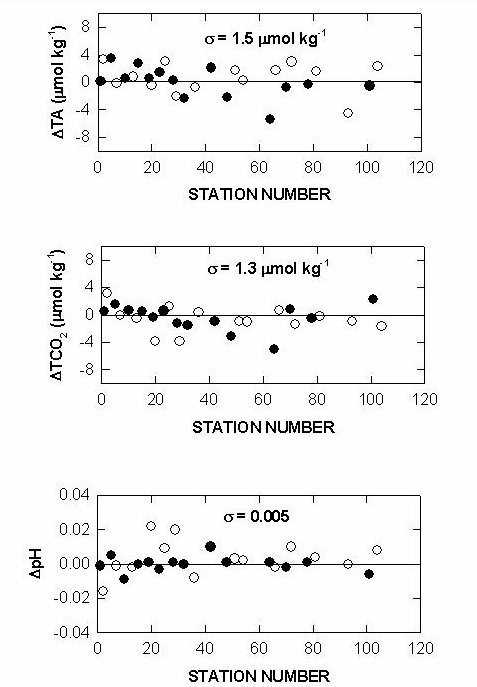 Regardless, if the function is valid, then for these data, waters that have alkalinity values less than ~2400 µmol/kg have a significant amount of bomb-produced radiocarbon. If this is true, and if the values have changed little since GEOSECS, then most of the bomb contamination had to have been distributed throughout most of the water column even as early as the mid 1970s. Figures 27-29 show gridded sections of the Δ14C data. The data were gridded using the "loess" methods described in Chambers et al. (1983), Chambers and Hastie (1991), Cleveland (1979), and Cleveland and Devlin (1988). Figure 27 shows the main zonal cruise section along ~62°S. The colors in the image indicate Δ14C while the contours are CFC-11 concentration [pmol/kg; preliminary data from Bill Smethie (LDEO) and Mark Warner (UW)]. Significant resolution is lost in the deep water Δ14C since most of the variability is near the surface. Nevertheless, a strong correlation in the two distributions is immediately apparent. 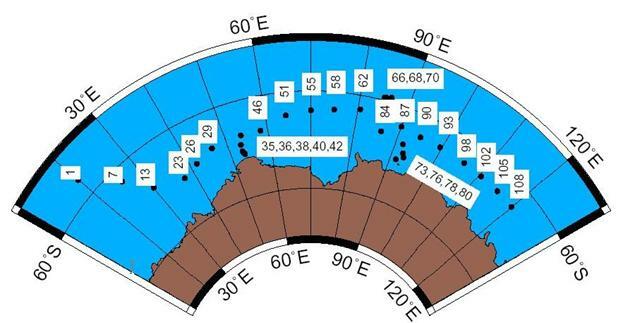 The bottom waters both east and west of the Kerguelen Ridge (~80°E) have appreciable chlorofluorocarbon concentrations and are most likely contaminated with bomb-produced radiocarbon. 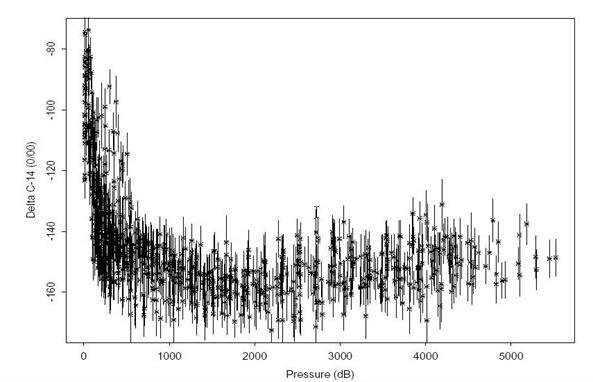 The highest near-bottom (pressure > 3750 dB) Δ14C values along this section range between -140o/oo and -130o/oo and are comparable to near-bottom waters at similar latitudes in the Pacific (Key and Schlosser 1999). Figures 28 and 29 show contoured sections of the Δ14C distribution along 65°E and 90°E respectively. Note that the contour interval used in the two figures is different. 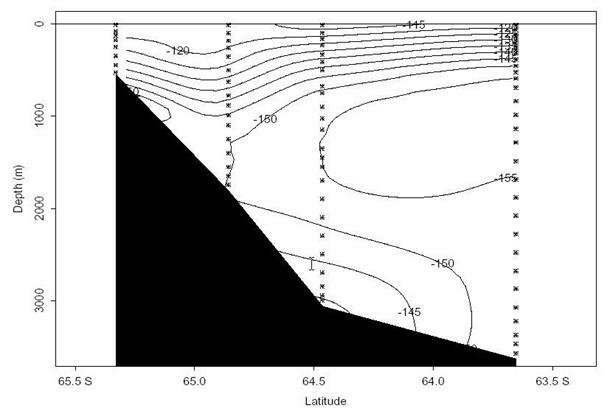 The 65°E and 90°E sections clearly show penetration of bomb radiocarbon along the Antarctic continental slope. Fig. 24. 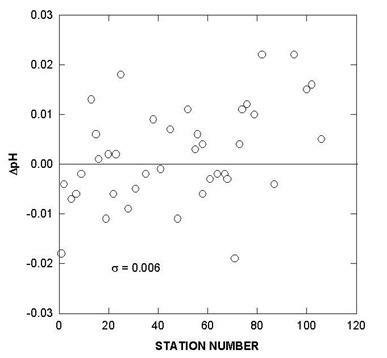 Δ14C results for S04I stations shown with 2σ error bars. Fig. 25. Δ14C as a function of silicate for S04I AMS samples. The straight line shows the relationship proposed by Broecker et al. 1995 (Δ14C = -70 - Si with radiocarbon in o/oo and silicate in µmol/kg). 2σ error bars are given for the Δ14C measurements. Fig. 26. Samples that plot above the line and have potential alkalinity values less than about 2400 µmol/kg are contaminated with bomb-produced 14C. Based on the new method devised by S. Rubin. Fig. 27. Δ14C concentrations along the main east-west section of S04I at approximately 62°S are indicated by color. Contour lines are preliminary CFC-11 concentrations (pmol/kg). Fig. 28. Δ14C along ~65°E near the Antarctic slope. The near bottom values along the lower slope indicate entrainment of new bottom water. Fig. 29. Δ14C along ~90°E near the Antarctic slope. The near bottom values along the lower slope indicate entrainment of new bottom water. This database (NDP-086) is available free of charge from CDIAC. The data are available from CDIAC's anonymous file transfer protocol area. The complete documentation and data can be obtained from the CDIAC oceanographic Web site. For additional information, contact CDIAC. Armstrong, F. A. J., C. R. Stearns, and J. D. H. Strickland. 1967. The measurement of upwelling and subsequent biological processes by means of the Technicon AutoAnalyzer and associated equipment. Deep-Sea Research 14:381-9. Baes, C. F. and R. E. Mesmer. 1977. The Hydrosis of Cations. John Wiley & Sons, Inc., 489 pp. Bernhardt, H. and A. Wilhelms. 1967. The continuous determination of low-level iron, soluble phosphate and total phosphate with the AutoAnalyzer. Technicon Symposia 1:385-9. Bradshaw, A. L. and P. G. Brewer. 1988. High precision measurements of alkalinity and total carbon dioxide in seawater by potentiometric titration-1. Presence of unknown protolyte(s)? Marine Chemistry 23:69-86. Broecker, W. S., S. C. Sutherland, and W. Smethie. 1995. Oceanic radiocarbon: Separation of the natural and bomb components. Global Biogeochemical Cycles 9(2):263-88. Carpenter, J. H. 1965. The Chesapeake Bay Institute technique for the Winkler dissolved oxygen method. Limnology and Oceanography 10:141-3. Chipman, D. W., J. Marra, and T. Takahashi. 1993. Primary production at 47°N and 20°W in the North Atlantic Ocean: A comparison between the 14C incubation method and the mixed layer carbon budget. Deep-Sea Research 40:151-69. Chambers, J. M. and T. J. Hastie. 1991. Statistical Models in S. Wadsworth & Brooks, Cole Computer Science Series, Pacific Grove, CA, 608pp. Chambers, J. M., W. S. Cleveland, B. Kleiner, and P. A. Tukey. 1983, Graphical Methods for Data Analysis. The Wadsworth statistics/probability series, Belmont, CA. Cleveland, W.S. 1979. Robust locally weighted regression and smoothing scatterplots. J. Amer. Statistical Assoc. 74:829-36. Cleveland, W.S. and S. J. Devlin. 1988. Locally-weighted regression: An approach to regression analysis by local fitting. J. Am. Statist. Assoc. 83:596-10. Culberson, C. H., G. Knapp, M. Stalcup, R. T. Williams, and F. Zemlyak. 1991. A Comparison of Methods for the Determination of Dissolved Oxygen in Seawater. WHP Office Report, WHPO 91-2. WOCE Hydrographic Program Office, Woods Hole, Mass. DOE (U.S. Department of Energy). 1994. Handbook of Methods for the Analysis of the Various Parameters of the Carbon Dioxide System in Seawater. Version 2.0. ORNL/CDIAC-74. Ed. A. G. Dickson and C. Goyet. Carbon Dioxide Information Analysis Center, Oak Ridge National Laboratory, Oak Ridge, Tenn.
Dickson, A. G. and J. P. Riley. 1979a. The estimation of acid dissociation constants in seawater media from potentiometric titrations with strong base. II. The dissociation of phosphoric acid. Marine Chemistry 7:101-109. Dickson, A. G. and J. P. Riley. 1979b. The estimation of acid dissociation constants in seawater media from potentiometric titrations with strong base. I. The ionic product of water (Kw). Marine Chemistry 7:89-99. Dickson, A. G. 1981. An exact definition of total alkalinity and a procedure for the estimation of alkalinity and total inorganic carbon from titration data. Deep-Sea Research 28A:609-23. Dickson, A. G. and F. J. Millero. 1987. A comparison of the equilibrium constants for the dissociation of carbonic acid in seawater media. Deep-Sea Research 34:1733-43. Dickson, A. G. 1990. Thermodynamics of the dissociation of boric acid in synthetic seawater from 273.15 to 318.15K. Deep-Sea Research 37:755-66. Elder, K. L., A. P. McNichol, and A. R. Gagnon. 1998. Reproducibility of seawater, inorganic and organic carbon 14C results at NOSAMS. Radiocarbon 40(1):223-30. Joyce, T., and C. Corry. 1994. Requirements for WOCE Hydrographic Programme Data Reporting. Report WHPO 90-1, WOCE Report No. 67/91, WOCE Hydrographic Programme Office, Woods Hole, Mass. U.S.A. pp. 52-55. Unpublished Manuscript. Johansson, O. and M. Wedborg. 1982. On the evaluation of potentiometric titrations of seawater with hydrochloric acid. Oceanol. Acta5:209-18. Kester, D. R. and R. M. Pytkowicz. 1967. Determination of the apparent dissociation constants of phosphoric acid in seawater. Limnology and Oceanography 12:243-52. Key, R. M. and P. Schlosser. 1999. S4P: Final report for AMS 14C samples. Ocean Tracer Lab Technical Report 99-1, 11pp. Khoo, K. H., R. W. Ramette, C. H. Culberson, and R. G. Bates. 1977. Determination of hydrogen ion concentrations in seawater from 5 to 40C: Standard potentials at salinities from 20 to 45. Analytical Chemistry 49:29-34. Lee, K. and F. J. Millero. 1995. Thermodynamic studies of the carbonate system in seawater. Deep-Sea Research 42:2035-61. Lueker, T.J., A. G. Dickson, and C. D. Keeling. 2000. Ocean pCO2 calculated from dissolved inorganic carbon, alkalinity, and equations for K1 and K2; validation based on laboratory measurements of CO2 in gas and seawater at equilibrium. Marine Chemistry 70:105-19. Marinenko, G. and J. K. Taylor. 1968. Electrochemical equivalents of benzoic and oxalic acid. Analytical Chemistry 40:1645-51. Mehrbach, C., C. Culberson, J. E. Hawley, and R. M. Pytkowicz. 1973. Measurement of the apparent dissociation constants of carbonic acid in seawater at atmospheric pressure. Limnology and Oceanography 18:897-907. Millero, F. J. 1974. Seawater as a multicomponent electrolyte solution. In The Sea, Vol. 5, E. D. Goldberg ed. pp. 3-80. Murray, C. N. and J. P. Riley. 1971. The solubility of gases in distilled water and seawater - IV. Carbon dioxide. Deep-Sea Research 18:533-41. NOSAMS. 1999. National Ocean Sciences AMS Facility Data Report #99-043, Woods Hole Oceanographic Institution, Woods Hole, MA, 02543, 2/16/1999. Sjorberg, S., N. Nordin, and N. Ingri. 1979 Equilibrium and structural studies of silicon (IV) and aluminum (III) in aqueous solution. II. Formation constants for the monosilicate ions SiO(OH)3- and SiO2(OH)22-. A precision study at 25°C in a simplified seawater medium. Marine Chemistry 19:521-32. Takahashi, T., J. Olafsson, J. Goddard, D. W. Chipman, and S. C. Sutherland. 1993. Seasonal variation of CO2 and nutrients in the high-latitude surface oceans: A comparative study. Global Biogeochemical Cycles 7:843-78. Takahashi, T., D. W. Chipman, S. Rubin, J. Goddard, and S. C. Sutherland. 1998. Measurements of the total CO2 concentration and partial pressure of CO2 in seawater during WOCE Expeditions P-16, P-17, and P-19 in the South Pacific Ocean, October, 1992-April, 1993. Final Technical Report of Grant No. DE-FGO2-93ER61539 to U. S. Department of Energy, Lamont-Doherty Earth Observatory, Palisades, NY 10964, pp. 124. Taylor, J. K. and S. W. Smith. 1959. Precise coulometric titration of acids and bases. J. Res. Natl. Bur. Stds. 63A:153-59. Weiss, R. F. 1974. Carbon dioxide in water and seawater: The solubility of a non-ideal gas. Marine Chemistry 2:203-15. Weiss, R. F. 1981. Determinations of CO2 and methane by dual catalyst flame ionization chromatography and nitrous oxide by electron capture chromatography. Journal of Chromatogr. Sci. 19:611-16.